But we’re here to talk about perfume, not music. Is Fêtes Persanes Eau de Parfum as moving as its muse? Perfumer Cécile Zarokian developed Fêtes Persanes. Its notes include bergamot, black pepper, elemi, cardamom, cinnamon, clove, white musk, lignum vitae, cedar, patchouli and vanilla. Fêtes Persanes is a classic spice fragrance. A twist of bergamot rind sharpens Fêtes Persanes’ top. Its heart is a wooden box of baking spices, with a bit more cardamom than cinnamon and clove showing. After ten or fifteen minutes, patchouli softens Fêtes Persanes’ edges. The vanilla is barely noticeable at first, but it grows over the next four or five hours until the rest of the fragrance falls away, and all that’s left is a soft, woody vanilla. Fêtes Persanes has the warm yet dry feeling I associate with spice-based fragrances that don’t have a lot of florals, milky notes, or skin-like spices like saffron to fluff them out and moisten them up. It’s emotional and rich, but almost mathematical in its approach, like Bach played on a perfume organ. Or, to draw another comparison, to me Fêtes Persanes feels like a hand-loomed rug. It’s colorful, crisply patterned, and two-dimensional. This is how many spice-based fragrances strike me. I begged for a sample of Fêtes Persanes after Tracy at Fumerie compared it to Fendi Theorema. After wearing them side by side, I find Theorema sweeter and more creamy than Fêtes Persanes. Theorema smells more of sharp cedar while Fêtes Persanes veers toward rounder guaiac wood, but they share a woody-spicy equation. Fêtes Persanes also reminds me of Laura Mercier Minuit Enchantée, except that Fêtes Persanes has more patchouli and vanilla and less ginger. Parfums MDCI Fêtes Persanes is $250 for 75 ml of Eau de Parfum (and $350 if you want the bottle’s resin bust topper). For information on where to buy it, see Parfums MDCI under Perfume Houses. 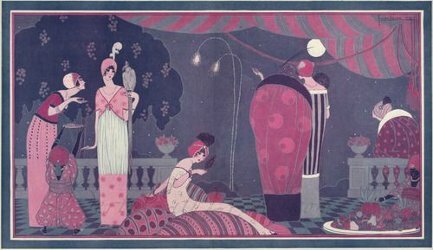 Note: top image is La Fête Persane, Georges Lepape, 1912, via recursivechic at tumblr. The higher price for the “Busted” bottle used to seem impossibly costly , now it seems quite reasonable (though still utterly out of reach for me). Isn’t it scary how quickly we get used to those prices? I remember thinking they were so much more expensive but then I read that they were originally porcelain and that they started doing the resin busts due to popular demand. I certainly like the busts and I don’t think$100 is a bad price for them but together with the fragrance, it’s too much for my budget. That said, that Invasion Barbare is perfect with a sculpted man on top. I do love a pretty bottle, but I’d be perfectly happy with a plain bottle as long as the perfume is great–and I’d appreciate the savings, too. And I adore Invasion Barbare! I liked this one, may pick it up this fall after it cools down a bit. It would be a fabulous fragrance for autumn! You’re right…I started listening to that piece, going, “Hmm…nice…” Then the voices started, and I went, “Hmm..ni…” and burst into tears. What is that feeling you can only get from choral music? I’ll be wounded all night! I know! There’s something about it that goes straight to the heart. I’m hit or miss with this line, from my limited sampling. I loved Invasion Barbare, enjoyed La Belle Helene, and hatred Les Indes Galante, which I swear smells like bubble gum on me. So bizarre. I’m dying that I didn’t get to try EdS, but I can’t wait to try the rest. They used to have a nice sampler set, and back in the earlier days of the line, I bought it. I really like Chypre Palatin, too. I got a sampler set of MDCI’s a year ago. I mostly really like them and this one sounds very good. Promesse and Enlèvement are still my favourites though. Thanks for reviewing! Those are both gorgeous. I think that along with Chypre Palatin and Invasion Barbare, those are my favorites, too. Well, I have to try this! MDCI a great line, and I like Theorema, although there is an anise note in that one that wears on me. Fetes Persanes sounds like it might be just right.